Funtastic Fairy Emily with Magic Faces Fairy Broni at an event on St. Patrick's Day 2011. Initially a desire to find some good quality face paint to create a great Halloween costume for my oldest daughter, then aged 4. That desire has grown into a business where I can use my creative & artistic side and have heaps of FUN!! I started Funtastic Faces in 2007 after much encouragement from my friends and family to turn my hobby into something bigger. I love the moment when a child looks into the mirror to see themselves transformed into something special!! Mostly self-taught, I have been building my skills, using some inspiration, imagination and practicing my bank of ideas on children (and adults) all over WA and with regular get-togethers with some amazing face & body artists here in Perth. I have also had the pleasure of attending workshops with some awe-inspiring International (Pashur, Jinny, Mark Reid and Nick & Brian Wolfe) and Australian Face & Body artists (Becstar Anthony, Ambah O'Brien & Annie Reynolds). Whether you are wanting Fairies, Princesses or Dragons, Jungle Tigers or Sweet Kittens, Superheroes or Monsters and more... Funtastic Faces will have a face for you!! Multiple Face Painters and Balloon twisters can also be provided. 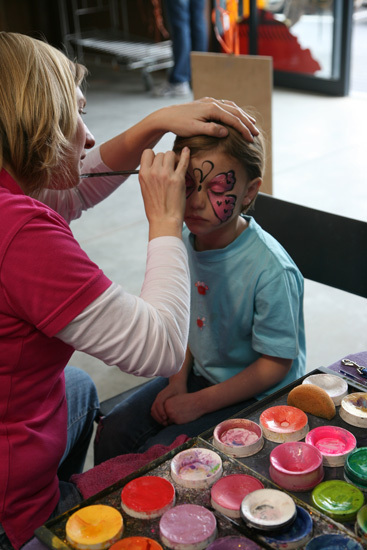 Funtastic Faces ONLY use the highest quality face & body paints and cosmetic glitter. The paints are water-based, feel nice on even the most sensitive skin and will easily wash off with warm soapy water. Funtastic Faces also carries $20 million dollar public liability insurance and has a valid Working with Children Card. Face Painters can come dressed in fancy dress upon special request. Contact us for more information.